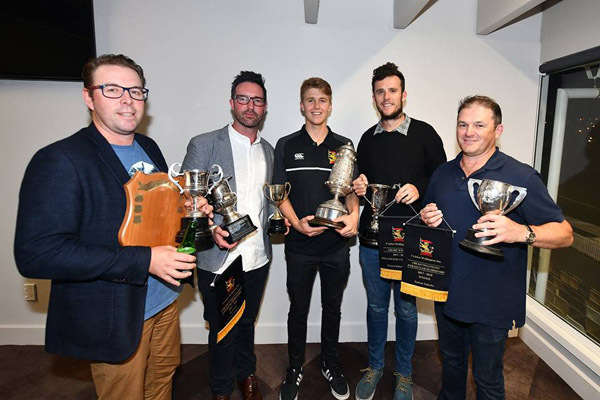 Congrats to all the winners at Cricket Wellington awards. 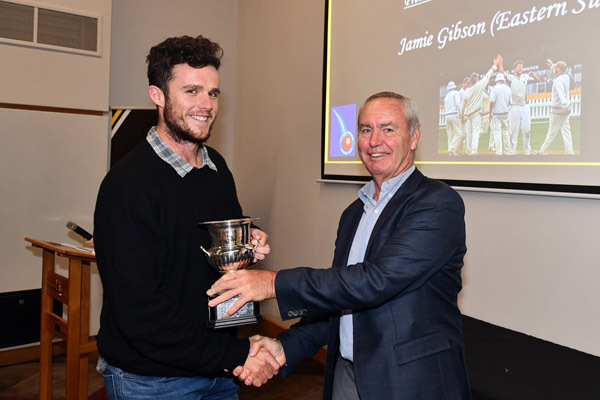 The MIGHTY EASTS scooped a number of awards including two grade championships. THE MIGHTY EASTS Win 2018 PEARCE CUP!!! Easts Premier team have now qualified 17 times in 17 years to play in the Pearce Cup final. After the abandoned game against Hutt Districts last Saturday we retain the top qualfier spot with 103.43 points for the final against Johnsonville. The 2018 final will be played at the Basin Reserve over 3 days Friday 30th March to Sunday 1 Apr 2018. Let’s get down to the Basin Reserve and support THE MIGHTY EASTS Premier Team !!!! An excellent start for the MIGHTY EASTS with 397-6 after the completion of 103 overs. It was a great team effort with the batting including a century to Jamie Gibson 122 - Matt Ansell 44, Fraser Colson 52, Jimad Khan 69 and Lauchie Johns 56*. Johnsonville then had a difficult task ahead of them and were all out for 208 with Peter Connell taking 5-45. Captain Lance Dry decided to bat again and after the lost of a few early wickets Easts were 79-3, with Luke Georgeson 50*, at stumps on day 2. A lead of 421 runs. Well we continued to dominate on the last day with Luke Georgeson scoring a century and a 2nd innings total of 261. This gave Easts a lead of 603 and the Johnsonville captain thought it was about time to shake hands. 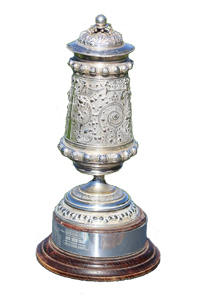 Drawn game but as Easts were the Top Qualifier meant we WON THE PEARCE CUP again !!!! 15th time in the last 17 years with us playing in the final for all 17 years !!!!! 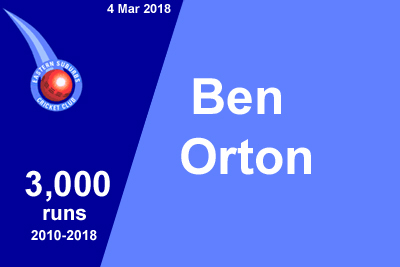 Ben Orton achieved 3,000 runs for Easts in the two day game against Johnsonville on 4 March 2018. His first 1,000 runs were achieved in 2012 and 2,000 in 2013. In the years Ben has played for EASTS he has scored 4 centuries and 26 fifties. Easts No. 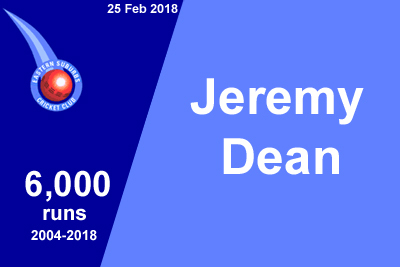 1 Premier batsmen Jeremy Dean achieved 6,000 runs for Easts in the CRICHQ T20 Cup Semi Final game against Taita on 25 February 2018. His first 1,000 runs were achieved 10 years ago in 2008, 2,000 in 2010, 3,000 in 2012, 4,000 in 2015 and 5,000 in 2016. In the years Deano has played for EASTS he has scored 7 centuries and 36 fifties. 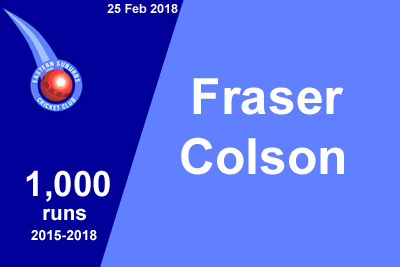 Fraser Colson scored his first 1,000 run for Easts in the CRICHQ T20 Cup Semi Final game against Taita on 25 February 2018. Fraser started with EASTS in 2015 and has scored 1 century and 11 fifties in that time. The three group matches to qualify for the CRICHQ T20 Cup Knockout have been completed with our Easts Premier team undefeated in all three games and will now play Hutt Districts in the quarter finals on Wednesday 14 Feb 2018. The Premier Reserve team had two wins but unfortunately just missed out on qualifying for the knockout rounds. Easts 194-7 V Hutt Districts 167-5 at Kilbirnie Park - Win for Easts !!!!! Get down there and support the MIGHTY EASTS TEAM !!!!!! 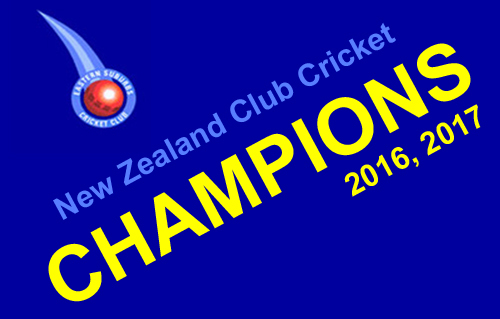 Next step the FINAL against Karori Premiers at the Basin Reserve on Wednesday 28th February 2018 starting at 4:30pm !!!! Well we started well with a wicket on the first ball for Jed Wiggins but then Karori settled in and managed to post a score of 150. Next our turn to bat and .............. 109 is all we could muster - disappointing in that we had scored well in all other games. 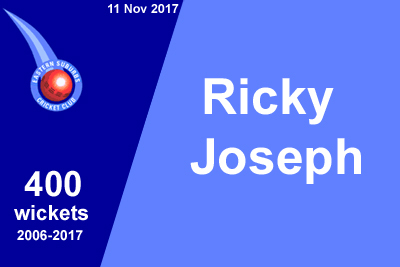 Ricky Joseph achieved his 400th wicket for Easts in the game against Hutt Districts on 11 November 2017. His first 100 wickets were taken in 2009, 200 in 2012 and 300 in 2015. Jamie Gibson scored his 3,000 run for Easts in the game against Onslow on 10 February 2018. His achieved his first 1,000 runs in 2013 and 2,000 in 2015. 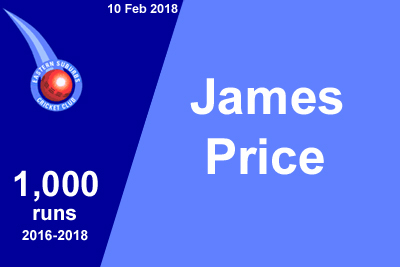 James Price scored his 1,000 runs for Easts in the game against Onslow on 10 February 2018. Fresh off his First-Class debut against Central Districts in November, young Easts wicketkeeper, Lauchie Johns, has now been selected in the New Zealand XI to face Pakistan in a 50 over warm-up match at Saxton Oval in Nelson on Wednesday 3 January. 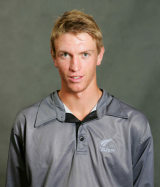 Joining Johns in the squad is his Easts club mate and Wellington Firebirds’ batsman, Fraser Colson. After leading the NZ XI to victory over the West Indies at Whangarei earlier this month, Colson returns to captain the side again. Easts Fraser Colson has been selected to captain New Zealand XI to play West Indies in a 50 over warm-up match in Whangarei on Saturday 16th December 2017. Fraser is the only Wellington player selected. 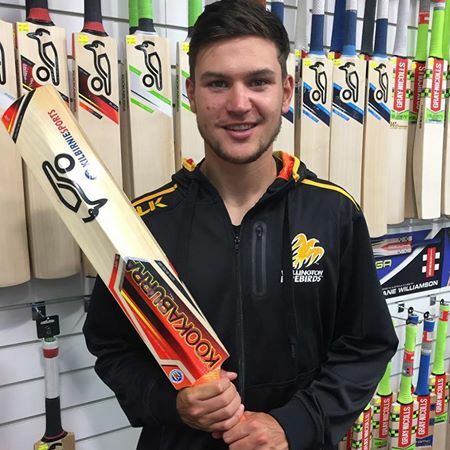 The Mighty Easts highly talented young cricketer Luke Georgeson scored an outstanding 117 off 154 balls at the National Under 19 tournament at Lincoln on 11 Dec 2017. Congratulations on a top effort Luke!!! We’re going to see a lot more from this promising youngster in the seasons ahead !!! In the 4th Grade 2 day match, Easts Aces v Collegians Axemen, just finished on Saturday 25 Nov 2017 - Joe Drysdale for the Easts Aces in the Axemen second innings bowled 8.3 overs 5 maidens 17 runs 9 wickets. Together with his 4-41 in the first innings Joe had match figures of 13-58. 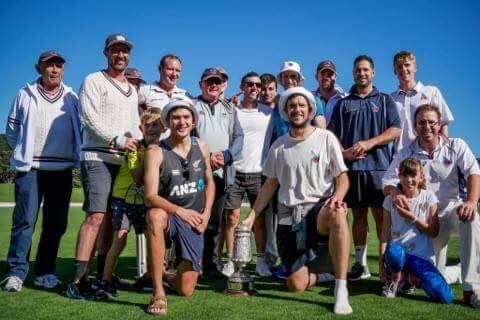 Congratulations to Easts Premier wicketkeeper / batsman Lauchie Johns - making his first class debut for the Wellington Firebirds today, 24 Nov 2017, in the four day Plunket Shield game against Central Districts in Nelson. 11 Nov 2017 playing for Easts Cobras in T20 grading, Scott Barnett made 109 off 32 balls including 7 x 4’s and 10 x 6’s. He repeated the performance on 18 Nov 2017 with 129 off 57 balls !!! Well done Scott now 238 off 89 balls - Your target is 3 in a row now !!!!! Two East players, James Price and Lauchie Johns, have been selected for the Dempster Shield T20 double header games on Sunday 12th November 2017 at Kelburn Park. Two Easts players, Luke Georgeson & Jed Wiggins, have been selected for the Wellington Under 19 team for the National Tournament from the 4th to 12 December at Lincoln University. Congratulations to James, Lauchie, Luke & Jeb. A cracking start to the season for the Intercity One Day side Easts Taxes. Belting a remarkable 409-7 off 40 overs, against the haplerss Indian Sports Evergreens, Easts won by a massive 349 runs!!! Easts Taxes mammoth tally was led by a swashbuckling 232 not out by mature and experienced (as opposed to old) ROSS GROUNSELL who included 22 x 4’s and 17 x 6’s in his huge total. It’s going to be a hard act to follow Ross!!! The following Vice President elections were confirmed at the recent Cricket Wellington AGM - 18 Oct 2017. 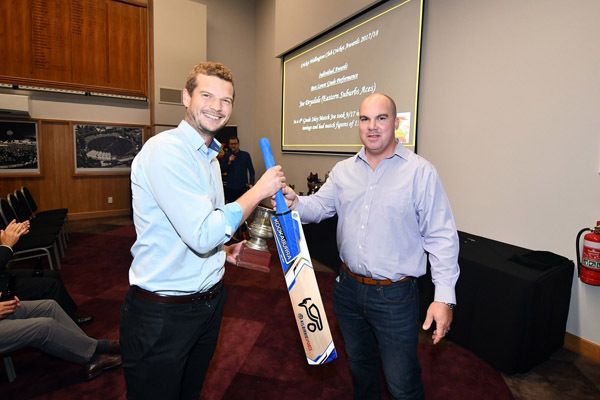 Gordon Dry and Todd Foster were both elected as Vice Presidents, in recognition of their service to cricket in Wellington (amongst other things, Todd is the long standing Honorary Solicitor of Easts CC). 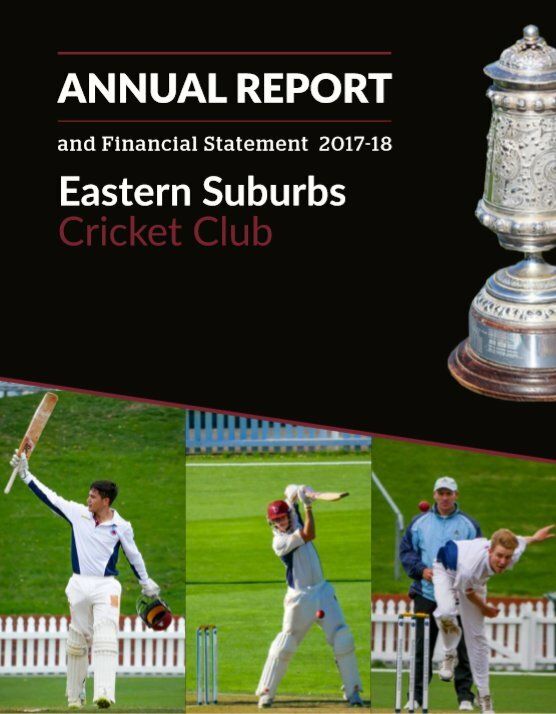 We see this as further recognition of the achievements and status of this MIGHTY Eastern Suburbs Cricket Club. Congratulations to Gordie & Todd. 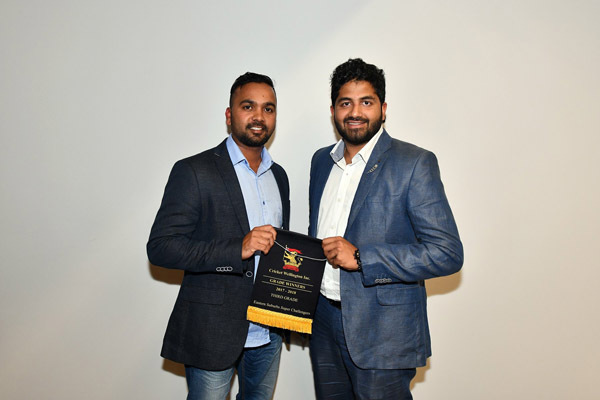 The Easts Club has entered two teams in this years T20 Knockout Competition - this will give more guys a chance to show their skills in the T20 format. Gordie will be in touch with more details as they are announced.